I’ve been there and trust me there are more awkward moments when you wish you could literally enter the ground. Folly means different things to different people. To one person, it is spending money on something you never would use, to another it is responding to a question before it is completely asked and to some other person, it could be constantly making wrong decisions. You see, folly isn’t often obvious at first until the repercussion of our action takes its toll on us. This is why I have put this piece together to help us (you and I) watch out for “folly” so we can rather walk in wisdom. 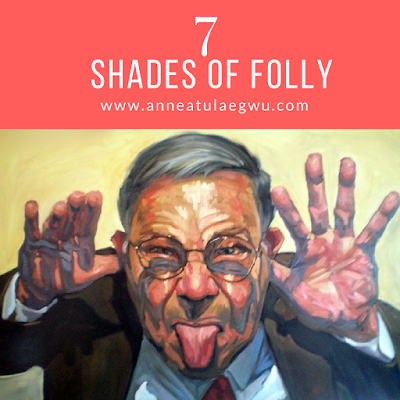 So below are the various shades of folly. God exists whether our wishes come true or not. Other ways people demonstrate this shade of folly is when they just won’t accept the truth about a situation in their life. Some people take it to be walking by faith. They often don’t realize that Faith acknowledges the situation and then places trust in God to help with the situation. Instead they totally deny that the situation exists. One area where we often make that mistake is in our health. Some people think taking drugs is demonstrating distrust to the healing power in the name of Jesus. I believe that the medical sciences are a demonstration of God’s wisdom. It is God who helps researchers find solution to the various plagues on man’s health. There are moments when God heals THROUGH medical sciences and there are moments when He heals simply by a word of prayer. It’s just like cases were one woman experiences vaginal birth and the other brings forth through Caesarian Operation (CS). Would we say that the later brought forth a less human? It’s the same thing with getting healed through medical support or without it. Healing is healing my dear. Look love, just so you know I’m not speaking out of ignorance; here is my story. At age 9 I was diagnosed with Asthma. It was a terrible season in life for me. I used inhalers and often got injected with aminophiline and crysta-something. I remember when I got into the boarding house at age 12, ventolin tablets were a high priority on my provision list. To cut a long story short, I had to live with that from age 9 till I was 14. The doctor had said I had to live with it for the rest of my life if I don’t outgrow it at age 16. I didn’t want to wait till I was 16. Then one day, I had an attack and I said, “God, I’m not going to use my inhaler. I have to get healed today! If I die you are going to explain to me when I come to Zion how this crap is supposed to take my life. You said I was healed by your strips so now I have to be healed”. It was a tough tough one. That term I had returned to school without my inhaler and I hid all the ventolin tablets my parents got for me therefore, when this attack came, I was either going to die or get healed. You know I dint die cos I’m writing this. The attack calmed and I eventually got a hold on air. It wasn’t easy trust me and yes, it was a big risk. What’s my point? Asthma had no cure at the time. I had just one option-JESUS and I chose Him. I acknowledged my condition. I tried to avoid triggers and when I eventually had an attack, I held on to him. Till date, I’m asthma free even though I’m still sensitive to cold like other normal people. Whether God heals through medical sciences or not? Healing is healing. Embrace it! Afterall, there are people who use all the medical care and eventually die. Doctors even tell you, “We cure but God Heals”. So darling, DENIAL is FOLLY. 2. CORRUPTION: The act of being immoral or dishonest. Psalms 14:1 says, “The fool is corrupt”. Most people associate immorality with the sins of fornication and adultery but immorality transcends those. It encompasses everything that opposes the standard of God and godliness. We are often faced with options and have to consciously prepare to choose right over wrong. Every form of corruption (wrong doing) is folly. 3. SIMPLICITY: The state of being easily convinced gullible and taking things at face value. Proverbs 14:15 says, “The simple believeth every word: but the prudent man looketh well to his going. Proverbs 8:5 says, “Oh ye simple understand wisdom”. I already trashed this one on an earlier post. CLICK TO READ more on the folly of simplicity. 4. SCORN: This is otherwise known as mockery. It is the act of deriding God’s word or rebelling against His instruction. Proverbs 14:6 says “A scorner seeketh wisdom and findeth it not but knowledge is easy unto him that understandeth. I’ve always been an opinionated person. I’m hardly in the middle on a matter. I often know what I want and I can adequately tell you in plain English. There were times when that felt like a great gift and there were times when life said,”Annie, you have to shut up”. Proverbs 29:11 says, “A fool uttereth all his mind: but a wise man keepeth it in till afterwards (the right time).” KJV emphasis added. Have you ever been beaten up for something you said? Have you ever lost a friendship or relationship because you couldn’t hold back your opinion? Then you need the wisdom of “shut-up and Let-go”. Sometimes, it doesn’t matter who is wrong or right. What matters most is knowing when you should hold your tongue rather than argue. Truth be told, you really can’t like everyone at least not to the same degree. However, we shouldn’t say we love them while they watch and go right behind them to make them walking corpses in the eyes of others. Be honest with yourself. Don’t go about telling people you don’t like them. Neither should you say you like them when you don’t. Doing so is being foolish. If you’ve got issues with someone, first talk to God before you talk to them. This is because the wisdom to relate with men is given by God never by our emotions. I’m learning to do this often too. 7. I-TOO-KNOW (ITK): The act of trusting your ignorance because you are the only one who doesn’t know that you don’t know. Proverbs 28:26 says, “He that trusteth in his own heart is a fool: but whoso walketh wisely, he shall be delivered. It’s folly to think that we can single handedly know all about a matter or embark on projects successfully. We should seek counsel often.